"King William's Act" codified the customary fishery regulations. The British government viewed the island as a seasonal fishing station. King William's Act bequeathed an array of problems. While the customs of the fishery figured prominently in the governance of early Newfoundland, formal laws were also established prior to the appointment of a governor in 1729. English settlements in early Newfoundland were not part of an official colony but rather commercial enterprises sanctioned by the Crown. The legal basis of the island's first colony at Cupids was the charter issued by James I to the London and Bristol Company, a joint-stock company in which 40 investors had bought shares. This grant did not bestow colonial status—Newfoundland did not receive a Royal Charter until 1825—but it did confer certain rights, liberties, and powers. Like the charters governing other English colonies in America, it formed a type of public contract between the sovereign and the individuals or corporation responsible for overseeing the settlement. To ensure that their investment remained secure, the shareholders issued a detailed list of instructions ordering the governor, among other things, to prevent idleness among the colonists and to ensure that religious services were held regularly. Troublemakers were to be sent back to England on the first available ship and publicly discharged from the company. The colony was not beyond the pale of English law, therefore, but operated within a specific set of written regulations. Over a third of this English news-sheet was devoted the Cupids colony in Newfoundland. Courtesy of the Centre for Newfoundland Studies, Memorial University of Newfoundland, St. John's, NL. The history of statute law begins with the 1699 Act to Encourage Trade to Newfoundland. Known popularly as "King William's Act" it codified the customary regulations of the fishery established in the Western Charters first granted to English merchants in 1634. When the newly-created Board of Trade moved to draft legislation for Newfoundland, merchants from Devonshire petitioned that no governor be sent to the island and that the fishery continue to be governed according to the customs of the migratory fishery. King William's Act confirmed the tradition that the master of the first English ship to arrive in a Newfoundland harbour after March 25th was by right the admiral of that outport for the upcoming fishing season. The second and third masters then became the vice- and rear- admirals respectively. Admirals had the choice of the best fishing rooms—tracts of the waterfront used for wharves, flakes, and stages—and were empowered to settle disputes over the possession of the remaining premises. Like the earlier charters, the act contained regulations for the conduct of the fishery, such as prohibitions against damaging stages, stealing fish nets, or selling alcohol on Sunday. The act also reaffirmed the existing method for dealing with serious criminal offences. Suspected felons in Newfoundland had to be brought to England for their trial. 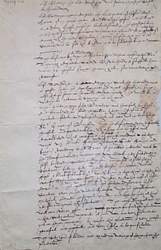 King William's Act stipulated that all robberies, murders, felonies, and	capital crimes committed in Newfoundland each year after March 25th, were to be tried, determined, and judged in any county of England, under commissions of oyer and terminer and gaol delivery. These offenses were to be tried according to the same laws and in the same manner as those committed in England. The task of apprehending offenders and arranging for their transport rested with the fishing admirals, who were further required to preserve the peace and good government in their harbour, to ensure that all of the act's regulations were enforced, and to keep a written journal for each fishing season. To augment this rather limited legal regime, King William's Act offered one significant reform: the naval commanders of the warships sent to patrol Newfoundland each summer could act as appeal judges to the fishing admirals' decisions. King William's Act reflected contemporary imperial policy. London was invariably wary of initiating policies which would place added burdens on the treasury. Between 1689 and 1763 parliament passed relatively few acts relating directly to the management of individual colonies. In the wake of the consolidation of the navigation system in 1696, the English government focused on defending specific domestic industries against foreign and colonial rivals. By protecting the West Country interest in the cod fishery, King William's Act formed part of a broader policy of using statutory law to promote English commerce. The British government viewed the island not as a colony but rather as a seasonal fishing station to be used solely for the benefit of the West Country fishery. Although never a productive source for sailors, Newfoundland was seen as a nursery for seamen—one in five men brought over each summer had to be a green man—and the Admiralty played an important role in its administration. Prior to 1811 the prerogative to settle and to hold property was in theory wholly subordinated to the	needs of the fishery, although in practice property rights were	recognized and enforced. Settlement continued to expand throughout the eighteenth century—often supported by the West Country merchants and traders—though its legal status remained uncertain and governors made sporadic efforts to restrict property use to the fishery. While some year-round habitation was inevitable and indeed necessary for the operation of the migratory fishery, the trappings of colonial government were not. Conventional wisdom held that the island's limited development did not merit the institutions normally allocated to settled colonies. In his treatise on the British empire, John Oldmixon pronounced that in Newfoundland, "there is no need of much Law, for the inhabitants have not much land and no money" (Oldmixon 18-19). British officials took a pragmatic view toward Newfoundland, remaining skeptical about granting the island its own legislature right up to the eve of representative government in 1832. A caricature by John Doyle (1797-1868) of Newfoundland's new legislative assembly in 1832. The 1699 Act has been universally decried as an unmitigated disaster. Its provisions did not correspond to the island's actual economic development—the increasingly complex cod fishery encompassed migratory and resident operations, West Country merchants and year-round settlers—and Keith Matthews argued that it was generally ignored in practice. With regard to judicial administration, King William's Act bequeathed an array of problems. It prescribed no specific penalties or punishments for those who broke its regulations or committed crimes other than felonies. It limited the magistracy to fishing admirals and naval commanders, neither of whom had commissions of the peace. Empowered simply to keep the peace, they had no specific instructions on how to issue warrants, take depositions, or bind persons in recognizance. The admirals were apparently too busy with their own fishing operations and seen as too biased in their judgments to maintain law and order. After the fishing fleet and naval squadron had left in the autumn, no legal authority existed whatsoever. The system of transporting suspected felons back to England proved extremely difficult to carry out. In most cases the logistics and costs of apprehending and incarcerating offenders, and shipping them when the fleet returned to England, outstripped the resources of both the visiting naval commanders and the fishing admirals.